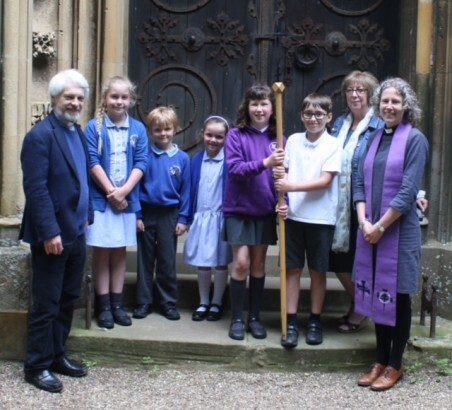 On Tuesday 5th June children from Loxley School safely delivered the Cross of Nails to Hampton Lucy School and the event was marked by a service in church lead by Reverend Rachel Saum. The Cross is travelling to all the church schools in the Diocese of Coventry to mark the centenary of its founding. Loxley School took the cross on their PGL adventure trip and Hampton Lucy children in Reception and Year 6 have made their own replica crosses from household nails. 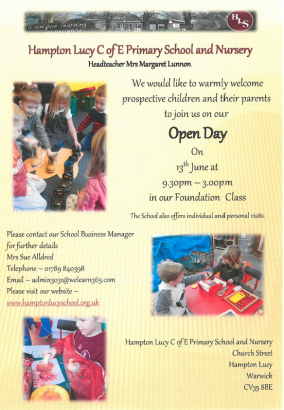 We would like to warmly welcome prospective children and their parents to join us for our Nursery Open Day on Wednesday 13th June 2018 from 9.30 pm to 3.00 pm. Request access to the personal data that we hold. Ask us to erase your personal data if there is no compelling reason for its continued processing. Shortly our website will have our new privacy notice for pupils and parents which explains in detail what personal data we hold, why we hold it and who we share it with. This also provides details of our Data Protection Officer (DPO) [schoolDPO@warwickshire.gov.uk] who provides us with advice on compliance with GDPR and our data protection obligations, and can be contacted if you wish to make a request or complaint about your personal data. The privacy notice also explains about your rights to complain to the Information Commissioner’s Office. We are currently reviewing our policies and procedures. New and revised policies will be published on the school’s website in due course. Your consent – we have made some changes to our data collection and [any other forms which have been revised] to bring them in line with the new law. This means that we may have to ask you to consent to things again. Thank you for your support as we continue working towards compliance of the new General Data Protection Regulation (GDPR). Children of Hampton Lucy get on their bikes for Sport Relief! On Wednesday 21 March 2018, the children of Hampton Lucy Church of England Primary School and Nursery got on their bikes to see how far they could go to raise money for Sport Relief. With the help of the loan of exercise bikes from members of the local community, the children cycled for a total of 572.78km. This collective effort was equivalent to cycling all the way to Hadrian’s Wall! In addition, all the children, from Nursery to Year 6, completed 8 laps of the school playing field, this equated to 1 mile. 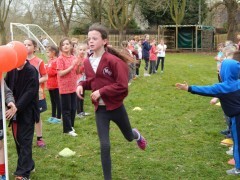 Parents and grandparents were encouraged to join their children on this charity run, to raise money for Sport Relief. Over the course of the day the children learnt about the importance of exercise as part of a healthy lifestyle. The children were instructed on how to use the equipment safely by Lucy Weston from Meon Vale Leisure Centre. They also learnt about how they can help people less fortunate than themselves by seeing some of the ways in which Sport Relief helps different communities both within the UK and the wider world. In total, the school’s endeavours raised £145. It was a fun but tiring day! 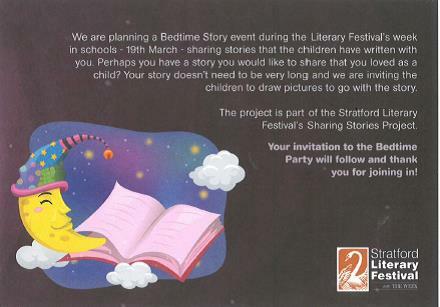 On Thursday 22nd March we joined forces again with the Stratford Literacy Festival to promote a love of stories and reading. Bedtime Story Party - Class 1 and 2 - Parents/carers were invited to write a bedtime story with their children and then invited to a Bedtime Story Party. Stories were shared and writer, Joseph Coelho read some of his work and inspired the children to write and tell more stories. Author Visit - Class 3 and 4 - Lucy Coats worked with the older children using her 'Beasts of Olympus' Series to share ideas, give tips and inspiration to encourage the children to write their own amazing stories. We are joining forces again with the Stratford Literary Festival to promote a love of stories and reading. 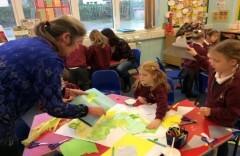 Classes 1 and 2 had a visit from Annie Ashworth who explained the exciting Bedtime Story Event Project. Parents are invited to write a bedtime story with their child. It doesn’t have to be long and teachers will prompt the children with ideas. The children could illustrate the story. The stories need to be in School by March 12th. Talking to your child about their ideas will be a perfect way to encourage storytelling and imagination – write down their stories if you can. Maybe, instead of reading a bedtime story, you could make up your own. 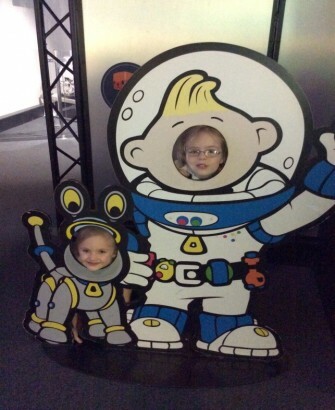 After Half Term you will be invited to join your child at the Bedtime Story Party! We will share some of your stories and the writer, Joseph Coelho, will read some of his work and inspire the children to write and tell more stories. Dressing up is optional but it would be fun for the children (and their grown-ups) to wear pyjamas etc! On the morning of Thursday March 22nd, Class 3 and 4 will have a visit from the author, Lucy Coates, sharing ideas, tips and inspiration to encourage the children to write their own amazing stories. Following recent training by the Warwickshire Safeguarding Team, it is clear that as we live in an ever changing and demanding digital world, that brings both excitement and challenges, our safeguarding protocols must protect our children. 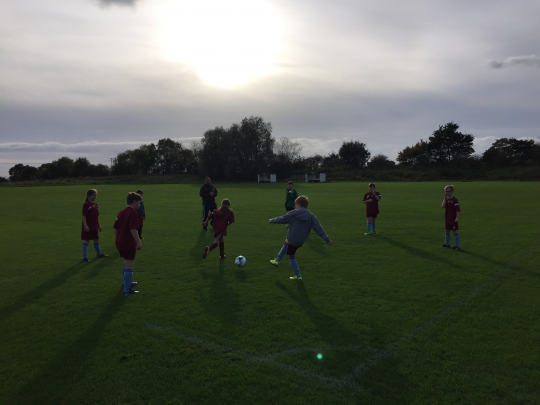 Warm up time at the football tournament just before half term. 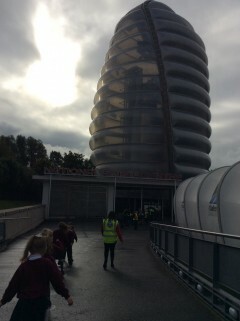 Class 2 had a wonderful visit to the Space Centre to support our topic. 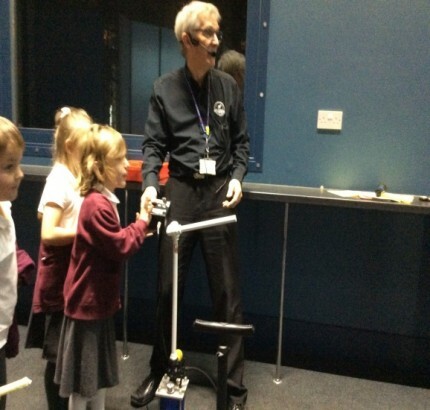 We explored the various galleries: finding out what it was like to be an astronaut in space, made a rocket and launched it and watched a 3D space movie. The trip inspired us with our learning back at school: making rockets, papier mache planets and a guide for the space centre for other schools. 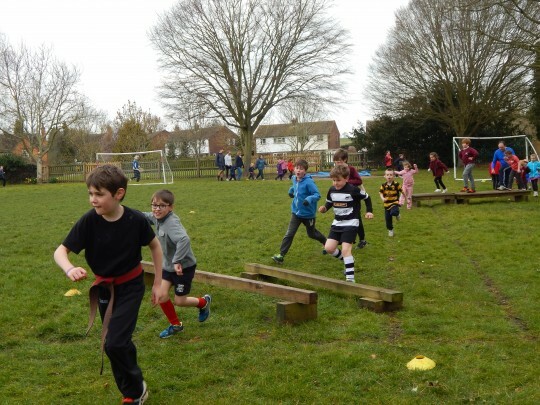 Children from KS1 recently took part in an Agility competition organised by Year 7 pupils at Kineton High School. The children had the opportunity to show off their skills in 6 activities, in throwing, jumping and running. Hampton Lucy competed against 3 other local schools and came second in the competition. On Thursday 5th October the children enjoyed a wonderful musical experience listening to the world famous Navarra Quartet as part of their music lessons. 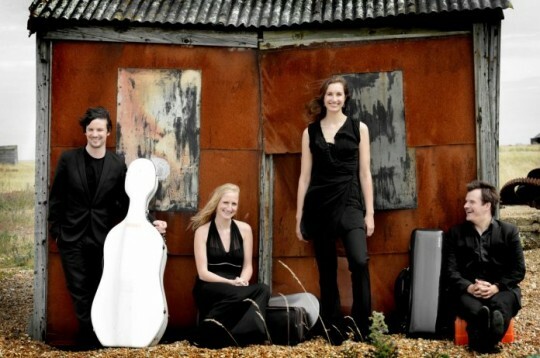 They are an Anglo-Dutch string quartet who have returned to Warwickshire for the first time since 2010. They have also performed at the Royal Pump Rooms in Leamington Spa as part of the season of music promoted by Leamington Music. 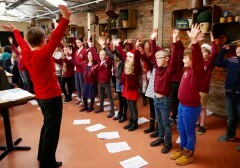 All the children enjoyed it and some of them were asked to help with conducting. On Sunday 8th October 2017 we will be celebrating our harvest festival at the Family Service at 9.30 am at The Church of Saint Peter ad Vincula in Hampton Lucy. Our children will led the service with the Rev Rachel Saum and Anne Richardson. 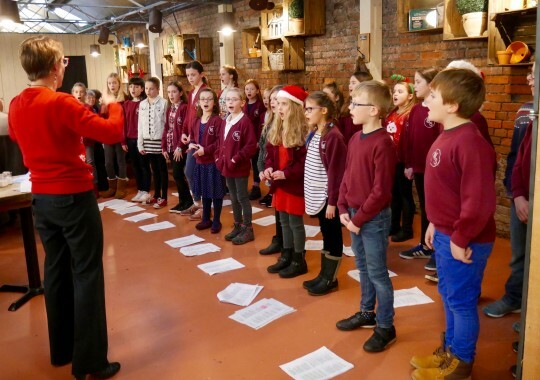 The Hampton Lucy School Orchestra will be led by Mrs Sue Appleyard and our children led the readings and prayers. 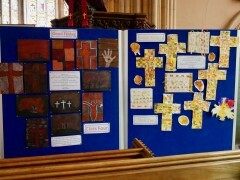 There was also a display of our children’s work - ‘Our Harvest’. Donations of food will be sent to The Fosse Deanery Food Bank. We also offer individual and personal visits. 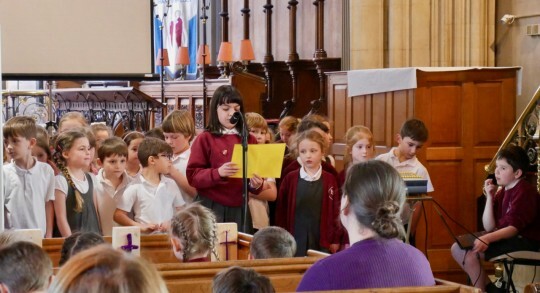 Following the recent ransomware attack on computers around the world, we have this week revisited the issue of password security with the older children as part of our Collective Worship programme. The ongoing issue serves as a timely reminder to us all to be vigilant when monitoring our internet accounts and to think before we click on anything that does not come from a trusted source. If you would like to find out whether your security details have been comprised, you might find the following link useful. On Wednesday 3rd May 2017 we were visited by two Olympians Richard Buck and Mandip Sehmi. Richard Buck was part of the 4 × 400 meter relay team at the 2012 London Olympic and Mandip Sehmi was part of the wheelchair rugby squad at the 2008 Beijing and 2012 London Paralympic Games. The Olympians spent the day in school talking to the children about what inspired them to get into sport and the benefits for adopting a healthy lifestyle. They worked with each class on various training drills and finished the day with relay races and a version of wheelchair rugby. 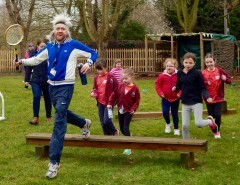 A Year 5 parent quote: "just wanted to send thanks to whomever organised the visit from the athletes today. 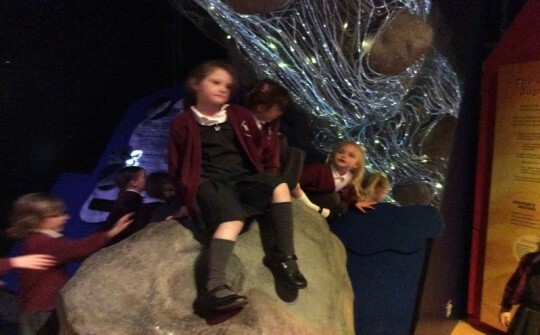 It sounds like a really fantastic and inspiring visit, my child is clearly enthused anyway! It was great to hear the children all chattering about it at the end of the day. 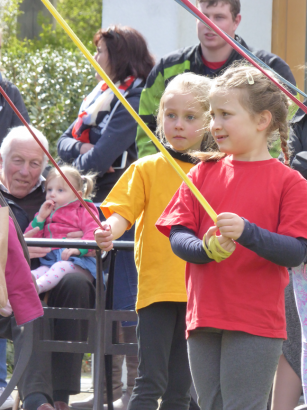 A great success, and thanks due to everyone involved". 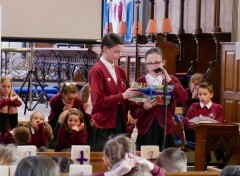 The Easter Service was led by Year 6 with reading and prayers. Following our recent Ofsted Inspection the final judgement has now been published. Please see download file below and the latest Governor Newsletter. 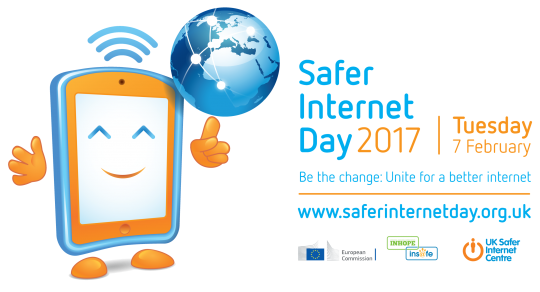 The following is an extract from the final judgement of - "The school Continues to be Good"
The children of Hampton Lucy CofE Primary School and Nursery took part in Safer Internet Day on Tuesday 7th February 2017. In addition to discussing how they can stay safe online during their Collective Worship, the children in Key Stage 2 spent time designing posters and making films to advise people about how they can keep themselves safe, particularly when taking part in social media activities. By taking part in a series of practical activities, the children also learnt that things you see on the internet are not always what they seem and then looked at strategies to help them know what to do should they encounter something which made them feel uncomfortable. All children were reminded to seek the advice of a trusted grown up and to make sure that they are only communicating with people they know. 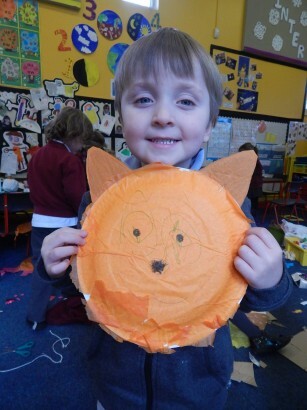 As part of our Animals topic Class 2 have been learning about Africa and African animals. We had an African workshop where Father Clement from Nigeria who is based at St. Gregory’s Roman Catholic church in Stratford shared his experiences. 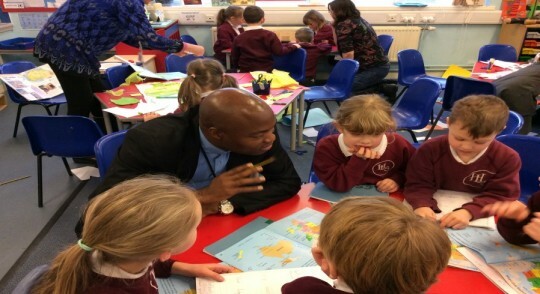 Two parents who have lived in South Africa also helped the children sharing African games and food. We made masks, a collage of Africa and rain makers. 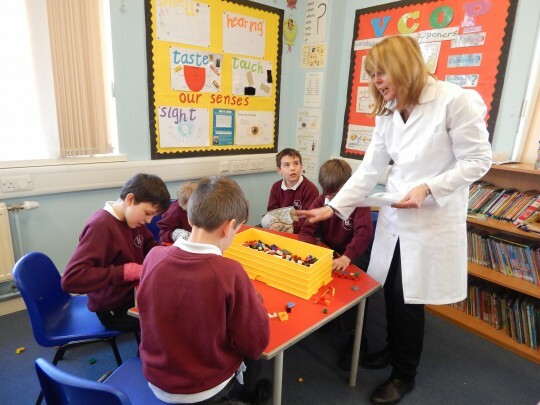 HMI Inspector Heather Simpson made a one day, short inspection visit to the school to monitor the school’s quality of provision against the Ofsted Framework. Heather spent the day meeting with myself, the school business manager, senior leaders, staff and pupils and representatives from the Governing Body. In addition she undertook learning walks accompanied with me around each classroom looking through pupils’ books and talking to them. Heather also took part in Wednesday Worship lead by three Year 5 pupils and this highlighted the children being independent learners and showcased the excellent behaviour of the children in the school. I was very proud of the commitment and enthusiasm of all the staff during the day, they were incredibly supportive throughout the process and proved what a fantastic team they are. The children were also great and demonstrated a fantastic work ethic and were keen to share their learning and ideas with the inspector. We are now waiting a final letter confirming the final grading within the next two weeks. This letter will outline all the key strengths of the school and progress since the last inspection in 2011. The letter will also indicate targets for future improvement. We look forward to sharing the outcomes and hope you understand that in the meantime we are unable to give you any indication of the final judgement. We are fortunate to have the opportunity to participate in an exciting project being organised by The Stratford Literary Festival. On Tuesday 28th February 2017, children’s author Sarah McIntyre will be in School to speak to the children about her engaging and funny books, and to share stories and ideas. 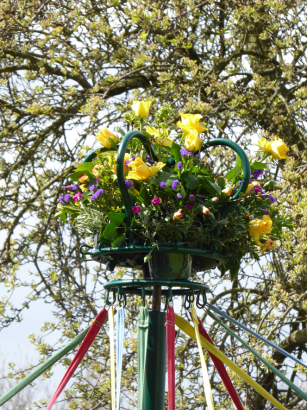 Sarah’s visit will be followed by three workshops (each lasting two hours) that will focus on the theme “funfairs”. 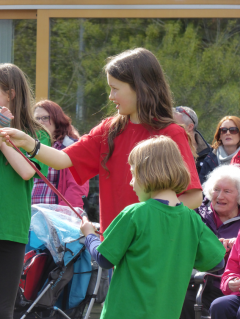 Monday 6th March at 9.15 am – The Playbox Theatre will work with Classes 1 and 2 on drama activities. 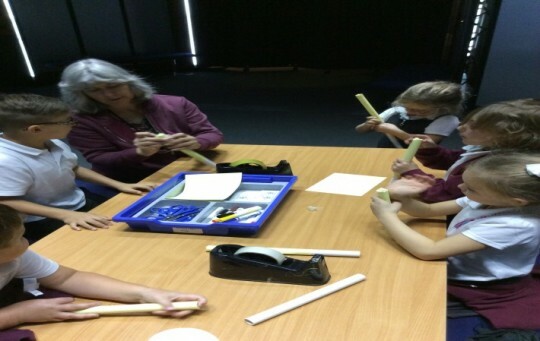 Thursday 16th March at 9.15 am – Escape Arts will work with Class 3 on arts activities. Tuesday 21st March at 9.15 am – Helen Watts (local children’s author) will work with Class 4 developing their creative writing. 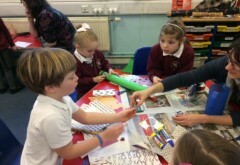 Wednesday 29th March at 10 am – Sarah will return to view and celebrate the children’s work. 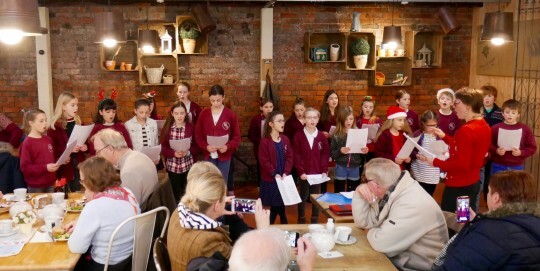 The Choir were asked, by popular demand, to sing again at the Charlecote Garden Store in the run up to Christmas. Our thanks to Mrs Honey for her support at this event. Please use the link below to access the information from Warwickshire County Council - Keeping Children Safe Online. Margaret Lunnon Headteacher and Dave Holland Chair of Governors, warmly welcomed Nadhim Zahawi MP for Stratford Upon Avon and Canon Linda Wainscot Director of the Board of Education Coventry Diocese to officially open our new classroom and kitchen. 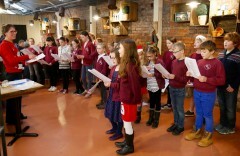 Other guests included Governors, neighbours, The Friends and representatives from the wider community. Nadhim and Canon Linda thanked pupils and staff for being invited to an 'outstanding school'. 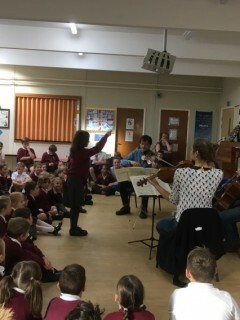 Our guests listened to music played by the school orchestra led by Sue Appleyard and festive singing from all the children. Refreshments were provided by Warwickshire County Caterers who will be providing hot meals from our new kitchen for all our children from January 2017. 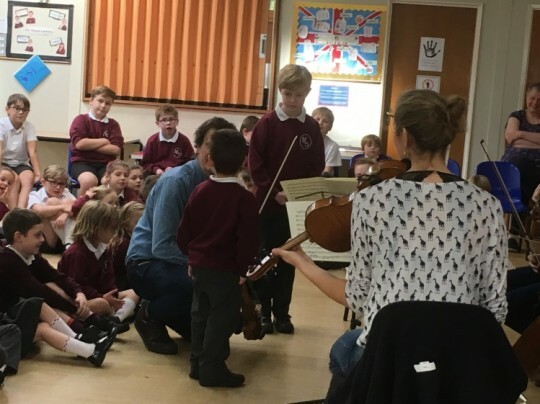 It was a huge pleasure to welcome the Elias String Quartet on Thursday 24th November during our Music time. The Elias String Quartet is internationally acclaimed as one of the leading ensembles of their generation. Known for their intense and vibrant performances, the quartet has travelled the globe collaborating with some of the finest musicians and playing in the world’s great halls. 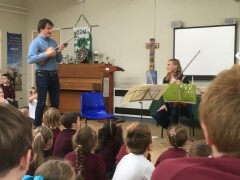 The Quartet performed pieces by Haydn, Britten and Beethoven including a piece demonstrating the technique of Pizzicato. The Elias Quartet gave a concert last Friday at the Royal Pump Rooms, Leamington Spa which was recorded by BBC Radio 3. The announcer talks about the three days the Elias Quartet spend in the area and mentions Hampton Lucy in his preamble to the second half. The programme was broadcast on Tuesday 29th at 7.30 pm on BBC Radio 3 and is now available on the BBC IPlayer Radio. Thank you to everyone who was able to attend the recent Parents Information Evening. For those parents/carers who were unable to attend the Design and Technology Presentation can be found as a download file below. A Statutory Inspection of Anglican and Methodists Schools (SIAMS) report took place on Thursday 29th September 2016. A copy of the full report is available as a download file. It is great that all children who have peripatetic lessons in and outside of school are able to share their skills at the musician’s concert. A range of instruments including piano, guitar, flute, clarinet, recorders and saxophone performed various pieces of music from different genres ranging from ‘I Love Rock and Roll’ to ‘Das Schaukelpferd’. It was wonderful to have so many parents/carers and grandparents to celebrate music at Hampton Lucy. 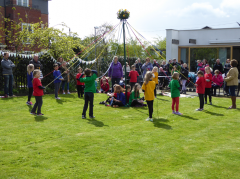 On Saturday 30th April the Hampton Lucy C of E Primary School Maypole Squad returned for the second year running to the Hill Close Gardens, Warwick as part of their Celebration of May Day and Springtime with a selection of traditional dancing set amongst spring flowers and displays. Our thanks go everyone who was able to join us during the afternoon, to Mrs Richardson, Music Teacher, for organising the event and Mrs Allerton for the fabulous maypole crown flowers. Once again a very big thank you for bringing the children last Saturday. Their maypole dancing was excellent and enjoyed by many people. They were all really well-behaved and polite too: a real pleasure to have in the gardens and a real credit to the school. We also had good takings in the café that weekend! Many, many thanks again to you, Mrs Richardson and the children. 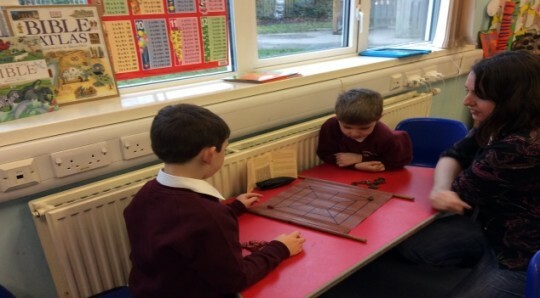 The children have recently taken part in a theme week as part of a drive to achieve a broad and balanced curriculum. On Monday all children took part in a Science Day. Children from Reception through to Year 6 worked together on a carousel of activities with the aim of having fun whilst gaining a greater appreciation of how Science can be used practically as a part of everyday life. On Tuesday, the school hall was transformed into a French café to give the children an opportunity to use their conversational French in a practical context. Patrons to the café were able to sample various French pastries and cheeses specific to different regions of France. 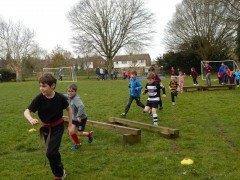 The school raised money for Sport Relief on Wednesday. All children completed the Sport Relief Mile and the children were invited to come to school dressed as their favourite sporting hero for the day. 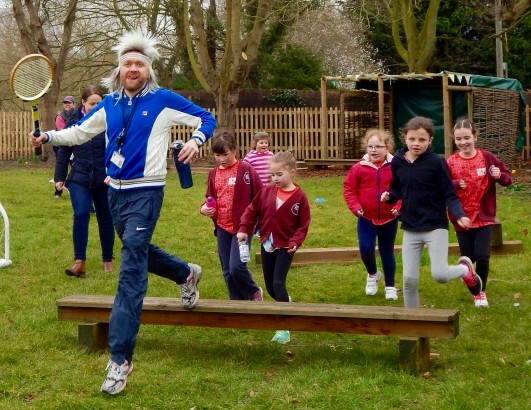 They were joined by some familiar faces from the world of sport as the teachers joined in the fun by dressing up as their favourite sporting heroes – Laura Davies, Princess Anne and Björn Borg were all spotted taking part in the run! 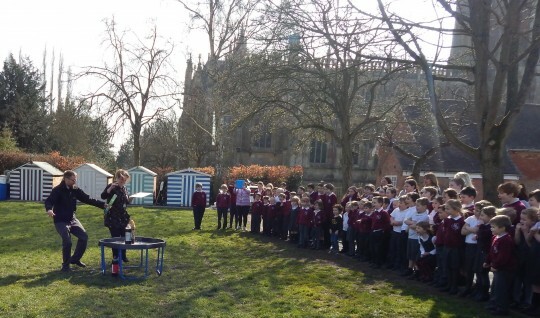 Shakespeare Week was celebrated on Thursday as the children took part in planned activities to celebrate the 400th birthday of Stratford’s most famous son. As well as looking at some of the works of Shakespeare the children were also asked to reflect upon what life would have been like in Shakespeare’s time. The week concluded with a whole school art project reflecting upon the Easter Story. As a part of the project, all children were invited to weave their own prayer into a banner that has since gone on display in St Peter’s Church in Hampton Lucy. The children enjoyed the varied experiences and are already looking forward to the next planned theme week in the Summer term! The video we made about "our voice" is based on who we learn from and what learning means to us. We worked together as a team and had a lot of fun making it. This half-term children in KS2 have been shaking their tail feather and learning some dance routines. Over 6 weeks the pupils have been put through their paces in street dance and disco, two very differenct styles of dance, both allowing them to express their creative side in an alternative way. The children have worked hard, and picked up the routines quickly, allowing more complex moves to be added challenging those with natural rhythm. It is clear from the photographs that everyone has tried their best and enjoyed this part of the PE Curriculum. Please use the link below to view video of street dance and disco. Hampton Lucy School has an exciting new resource thanks to the generosity of local company Valefresco. 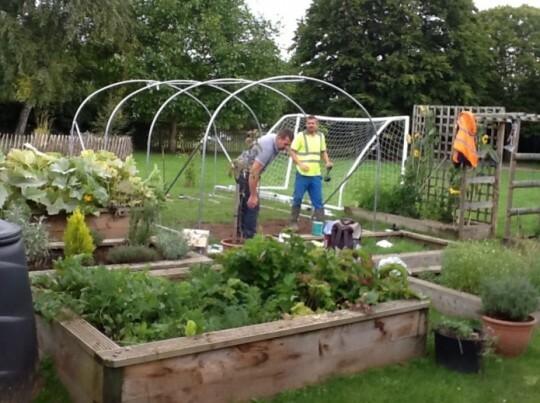 The school’s garden now contains a magnificent poly tunnel, bought and built with a donation from Nick Mauro and his team at Valefresco. 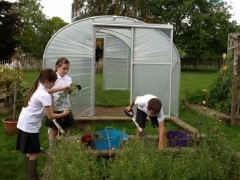 The children are looking forward to growing a wider range of produce and using this new learning space all year round. The company also bought tools and a wheel barrow which have already been put to good use. 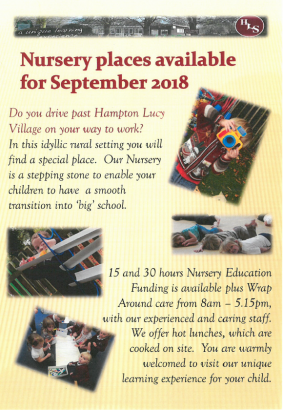 We will bring you further up-dates on planting and growing at Hampton Lucy School in the Spring! On the afternoon of Tuesday 9th June, Years 2, 4 and 6 visited The Forest Hermitage in Sherbourne. This was an opportunity for the children to experience another religion and broaden their understanding of other cultures and beliefs. The children shared their experiences with the rest of the school. Please see download file below. 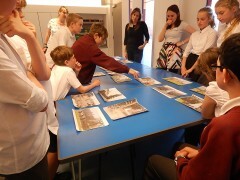 On June 5th, Year 6 returned to Compton Verney for the final stage of their work with photographer Faye Claridge. Their task was to curate an exhibition to tell the story of their involvement with the Kern Baby Project. 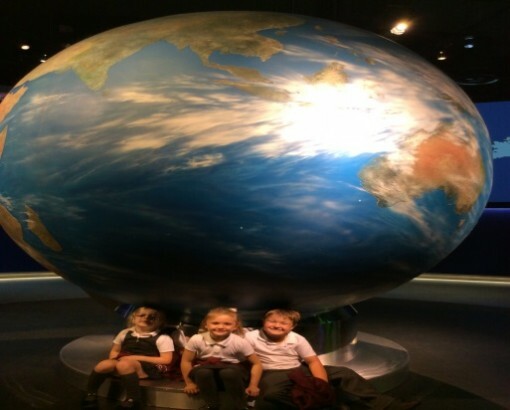 The children were privileged to spend time in the Canaletto exhibition, viewing the amazing masterpieces. They also looked at a series of photographs taken between 1975 and 1980 documenting everyday life in Yorkshire. They were guided through the exhibitions by one of the curators at the Gallery. Having picked up lots of ideas, the children began to organise their own display. Firstly they had to decide which of their photographs should go into the final show – not an easy task as space was limited, they had taken loads of photographs and everyone had to agree! They then decided where to position the photographs, what size they should be, whether to mount the photographs or not and the background colours. 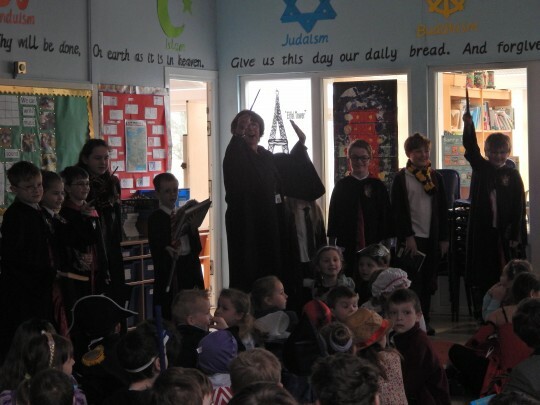 The children worked well together, often taking decisions by voting, and at last the final choices were made. The staff at Compton Verney will now mount the exhibition which will stand alongside Faye Claridge’s work. 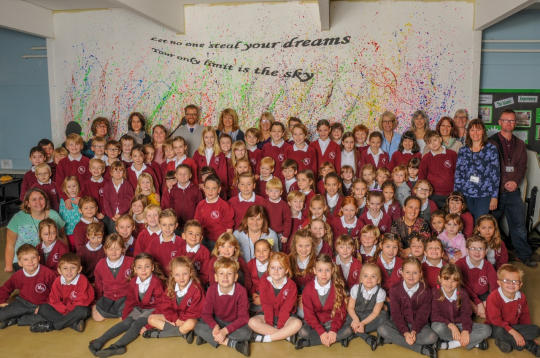 The Year 6 children, their buddies in Reception and their parents will be invited to a private viewing of their work before the end of the Summer Term. 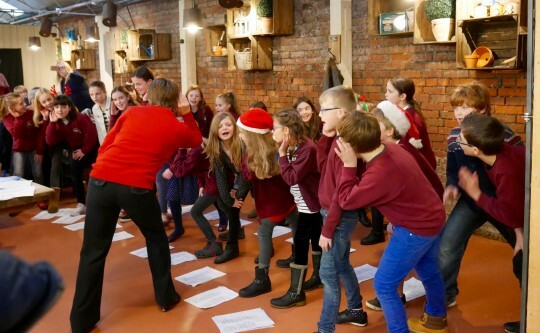 The children have had a wonderful experience during this project, working with professional artists in a world-renowned Art Gallery. They have had a glimpse behind the public face of the Gallery and had the opportunity to work towards their Art Awards. Class 4’s Insect hotel is on the way! 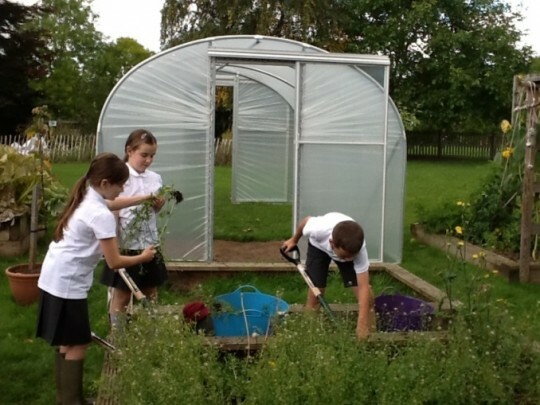 This year, Class 4’s project is to build an Insect hotel and a Bee and Butterfly garden. 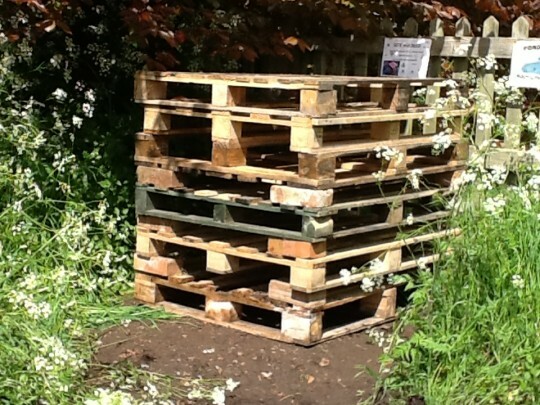 The Insect hotel was started on the 19th of May 2015. Hopefully the hotel will encourage many different species of insects. The hotel is made of wooden pallets and bricks. The children carried the pallets over to a corner near the pond where the ground had been flattened. The pallets were stacked on top of each other and the hotel gradually came together. There are 7 layers and they will be filled with cane sticks, grass, hay, leaves, sticks and pine cones to make a cosy home for insects. For even more luxury, it will have a tiled roof! The Bee and Butterfly garden will be in front of the Insect hotel where there is buddleia growing and pots of lavender will be placed to attract butterflies. 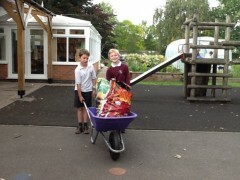 We are planning to sow wild flower seeds too. Hopefully we’ll be seeing different varieties of butterflies and bees very soon! Thank you to the people who have already kindly donated to the building of our hotel, we hope to keep you updated on any new residents! 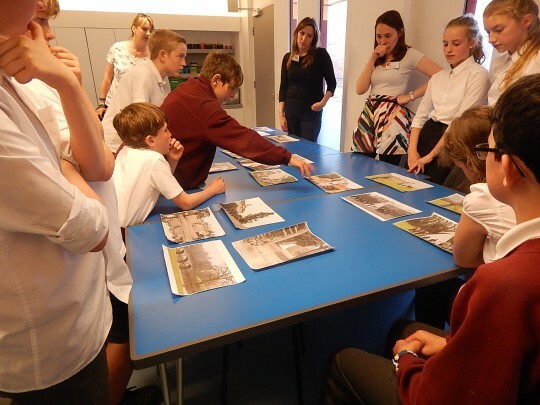 On Friday 15th May, Faye Claridge and Alice Kirk came into School to present Year 6 and Reception with photographs to commemorate their work with Faye on the Kern Baby Project at Compton Verney. Following the presentation, the children made Corn Dollies, with Year 6 helping their buddies with this traditional craft. Next month, Year 6 will return to Compton Verney to curate an exhibition of their photographs and other creative work inspired by the Project.Visitors will be able to view the children’s work alongside the photograph of our children and the Kern Baby which is the main focus of Faye’s Project. All the children have been working towards their Art Awards and their work is being scrutinised before the final presentations later this Term. 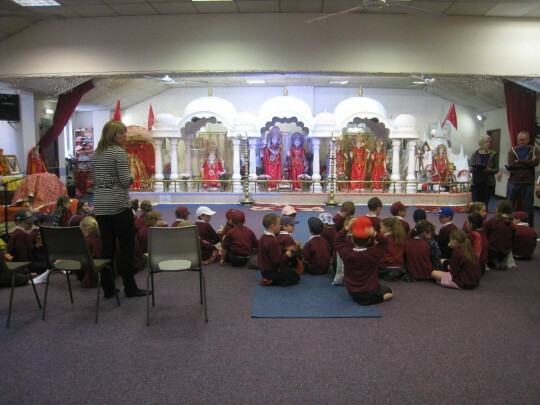 On Wednesday 22nd April, Years 1, 3 and 5 from Hampton Lucy Primary School were fortunate to visit to the Shree Krishna Mandir in Leamington. As a school we have been learning about the Hindu faith and this was a valuable chance for many of the children to understand their practices and lifestyles as well as seeing different beliefs and teachings. When we arrived we washed our hands and removed our shoes before entering the Mandir. We had a very knowledgeable guide in Mr Tara, who shared with us the basics of the Hindu faith. For the first part of this talk we sat in front of closed curtains, intrigued as to what was hidden. When they were opened we were presented with the most amazing sight of the deities. We were all surprised by how colourful, ornate, and beautiful the Mandir is. We listened to many of the stories about the deities, learning why they might have the appearance of many arms, many heads, blue faces, animal features etc. Yet most importantly we understood more about how these are not separate Gods, but are in reality the many different sides of the one God, Brahman. We were lucky to see many people attending the Mandir. This gave us the chance to observe the many practices people follow, such as turning on the spot, pouring of water, donating money and bowing of the head. We also had a chance to go very close to the deities and see the level of care and attention that is given to each one. The Mandir greeted us with warmth and generosity. The children asked a lot of questions, really trying to understand more about this fascinating religion. Finally as a parting gift, all of the children were given a wide range of fruits as a sign of their kindness. 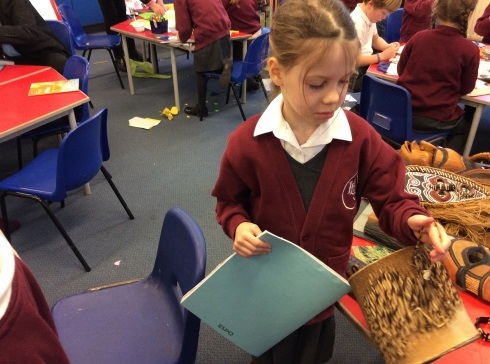 When we returned to school the children have been leading the learning throughout the rest of the school, so that they can share all that they have learnt. This provided a child friendly interpretation of the Hindu Mandir and showed how valuable an experience this was. The constituency of Hampton Lucy held an election today with 6 parties contesting the seat. Class 4 presented their party election manifestoes and addressed the voters (the rest of the school) during Collective Worship. A secret ballot was then held with each child putting their X on the ballot paper. The votes were counted and The Heart of the World Party – Philippa, Anwen, Daniel VT, Emily L and Emily H were duly elected. Fabulous!! I'm manning a real polling station and will be counting on Friday and Saturday. I love the whole election buzz. It's great to see the youngsters getting involved and interested in voting. Thanks for organising this. 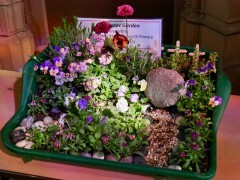 The following photograph is of the work completed by our children which was on show at Mary Arden's Farm. Parents/Carers were invited to a duo of workshops to help stay abreast of current trends in Education on the evening of Thursday 19th March 2015. Mrs Jackson hosted a workshop to demonstrate how you can best support your child’s learning in Mathematics. Mrs Jackson took parents/carers through our revised Calculations Policy and offered practical suggestions to help with home learning. Mr Degg hosted a workshop on how parents/carers can ensure that children remain safe whilst online. Mr Degg went through the current E-safety guidance and offered practical suggestions on how you can set up a secure home online environment. Please find below 'handouts' from the presentations for your information. We have received an influenza factsheet from the Consultant in Public Health for Warwickshire County Council and Coventry City Council for your information. We have been asked to encourage parents of children in at risk groups (with a chronic condition), and all parents of 2-4 year olds and of children in Years 7 and 8 at school to make sure they have their children vaccinated. For more information please see www.warwickshire.gov.uk/flu or www.coventry.gov.uk/flujab. We have also been asked to let you know that GPs are continuing to provide free flu vaccinations to those who are entitled until the end of January and participating pharmacies will be vaccinating until the end of March 2015. Furthermore we would like to highlight the importance of good hand hygiene in reducing the spread of respiratory viruses this winter. Local radio stations play an important part in communications between schools and parents/carers. For information about school closures listen to your local station. 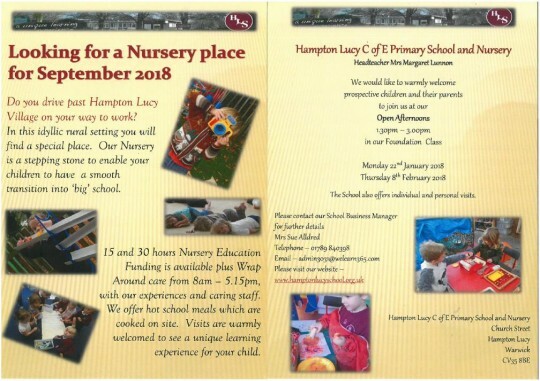 www.hamptonlucyschool.org.uk/news/newsandevents/news/ - every effort will be made to update the website. In the unlikely event of internet access not being available, school staff will try to contact parents/carers by telephone. If you are able to ‘pass the word on’ please feel free to do so. Where to go for information on a school closure in the event of adverse weather conditions or an emergency.